The sands of Arabia flowed below the wings of the aircraft depicting all the romance and expanse that they are assigned. Rugged, rock outcroppings rising from the silk of flowing sand dunes. Little settlements with the desert crouching all around, ready to reclaim the intrusion with one deep breath. The enchantment started there, out of the airplane window, effectively blocking out the infernal noise of some hundred teenagers from the Dubai American Academy unfortunately travelling on the same flight. It continued with my first sight of the pyramids. These immense structures, sentinels of such a long ago civilization, that fascinates till today. A civilization of such knowledge, art, skill and learning. If one were to only look at the Sphinx alone, it would tell the story of what intricacy, art, exactitude and ability lived in those ancient people. Even with the ages of weathering, that face and it’s features are compelling and powerful. It is a place to sit and breathe in the whole. The aura and energy of the stones needs to be felt and absorbed. Come back to take photographs another time. This time just sit and stare and feel. Block out the touts and the buses, see the camels, horses and pony carts and transport yourself to another time and the beauty of these monuments in their prime, of white robed men and women – with gold ornaments, etched in blue enamel. Regal processions and long floats on the green waters of the Nile. I haven’t even got to that stupendous river. Like a ribbon of green through the golden desert. That says it, who is to describe what that aerial sight was? Only the imagination. I still have not experienced the reality of it, just crossed a bridge and noted that it is not a river hemmed in by buildings, houses and filth. Atleast, what I have seen of it so far. This is my first day and other than the obvious tourist destruction so evident all over the east, it has been one of enchantment. We rested and ate at the quaintest little garden restaurant/resort along side a dirty canal in the Giza area. It is the most tackily charming little spot – and I can recommend it as a great lunch, tea, dinner, cool off, rest spot – Alzeb. Now my day is ending at the Cataract Hotel, one semi luxury – large resort, that has clean rooms and seemingly nice restaurants. Will sample tomorrow. It gave a good breakfast and has a lovely pool, otherwise I am sure there are infinitely nicer places to stay in Cairo. We got an extra day in Cairo due to some off road permissions. The pyramids at Sakkara was something that was just knocked off a list of things to see. The Museum was breathtaking and too large to absorb all at once, so we honed in on the Tutankhamen rooms and were they brilliant. Looking at that beautiful golden face, it is hard to firstly believe you are actually seeing the real thing and not a magazine picture. Then the mind boggles at just the creation of it. What a masterpiece (amongst many others) of workmanship created so many years ago and still so beautifully preserved. It has to be seen, no words can describe the awe and sense of the whole find and the history that was uncovered with the amazing treasures. The Khan al Khalili market is a cocktail of Chandni Chowk mixed with Janpath and stirred with Sarojini Nagar. The coffee houses in the square are loud and solicitious. The buildings of the mosque and the academy around it are quite beautiful. I am sure the market holds some fascination – to me it was too loud, too pushy, and ridiculously avaricious. Well done without, though I guess one needs to experience it once, to know that you really never need go back again. This trip was meant to be an off road, driving trip through the western desert, but due to some hitch in permissions we are doing a completely different trip, and the unknown adventure begins. We are still driving, but now to the Oasis of Siwa, also in the middle of the desert, miles away from anywhere, on the western border of Egypt. It was the place where the Oracle of Amon resided. The oracle that Alexander the Great came to consult. There begins the romance of it all again. Today has been a spectacular drive, down the Nile bypassing Alexandria and swinging left along the coast towards El Alamein. What a sight it is to see the Desert meet the azure blue Mediterranean!! El Alamein brought back every commando comic ever read, and a lot of history learnt. 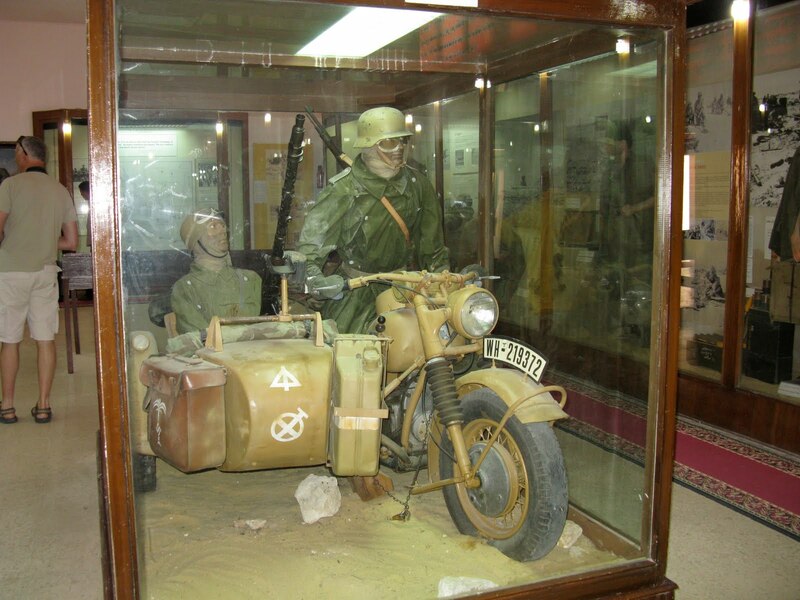 The World War II Museum is rather well done and you get a chance to see what that desert war must really have been.Wrecked spitfires and blown up troop carriers reminiscent of what an ordeal it really was –instead of the romanticized concept in ones head. Miles of sandy beach and this ridiculously blue Mediterranean was so enticing, we had to stop and have a swim. Finally reached the Oasis of Siwa well after dark, driving some 800 kms through completely trackless desert. 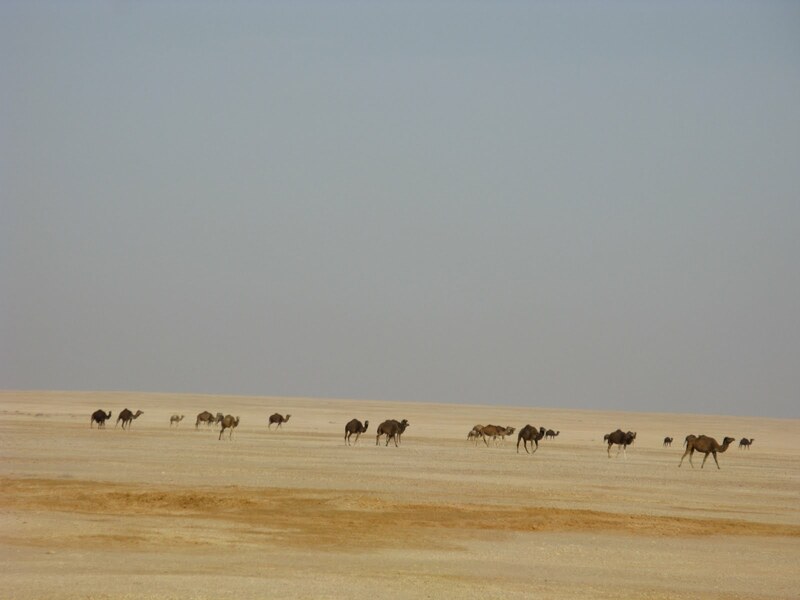 Wild camel herds were all we saw. Imagine yourself riding for miles through the desert on a thirsty camel, (obviously you are fried and thirsty yourself.) Come over a rise in the ground and look out across this great depression in the desert, filled with a sea of palm trees and a sea of water. Because that is exactly what it is. A fault in the earth’s crust an area well below sea level, creating a salt water lake and a fresh water one. It is like a dream, a mirage, waving palms and rippling water surrounded by craggy rock outcrops towards the west and north, dunes of golden sand on the south and east. Adobe (mud brick houses), there is absolutely no rainfall, so there are actually mud brick buildings. I know my grandmother told me that they had a three story mud built house in their village in Pakistan and I would always imagine it crumbling. Here there are the ruins of a five story fortress which has obviously stood for centuries. It is wonderful how all the new hotels have kept to the traditional building method, so the aura and ethos of the oasis is totally maintained. The three large hills that protrude out of the centre of this area are catacombed with old burial chambers of pharoanic beings of the 26th Dynasty who created the necropolis. Lit up at night they look supernaturally eerie from a distance. Quite fascinating on actually exploring, there are some remarkably well preserved frescoes. The ruins of the temple of Amon with some inscriptions dating from the 4th century BC, lie within the ruins of Aghurmi. The old fortress. This is the Oracle that Alexander the great came to consult before his campaign of conquest in Persia. He reached the oasis, supposedly by following birds across the desert. The oracle, Alexander’s court historians alleged, confirmed him as both a divine personage and the legitimate Pharoah of Egypt. It was a powerful space, whether by virtue of my interest or not, I can not say. A small room, with a few inscriptions on the wall (all that is left), open to the sky, but I think it was the history in those stones and just the fact that he came here and an oracle spoke!!! We have the advantage of a superb guide, a professor of Egyptology from Israel who does insist on speaking Hebrew but deigns to translate every so often. I am accompanied on this trip by a group of very interesting people from Israel, thus the Hebrew speaking professor. 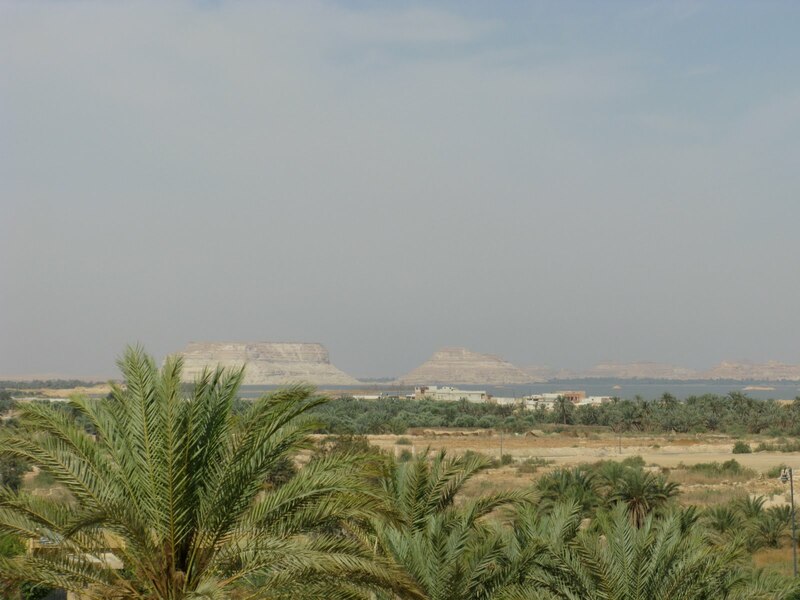 Once we had climbed around the catacombs and seen the amazing views across the oasis from the top of the hills, we drove through the waving palms on a little dirt road which bought us to Cleopatras pool. Situated at a crossroad amidst the palms. An ancient fresh water spring fills the pool that seems to serve as the swimming hole for all the people that pass by. There is a very pleasant little chai dhaba where we sat and watched the business of the oasis wander past. A little boy riding a tiny donkey cart laden with grass, stops his cart in the shade, takes off his djellaba and dives into the pool in his pajamas. Cools off, puts his djellaba back on and goes on his way. They all seem to do that as did some of our group. 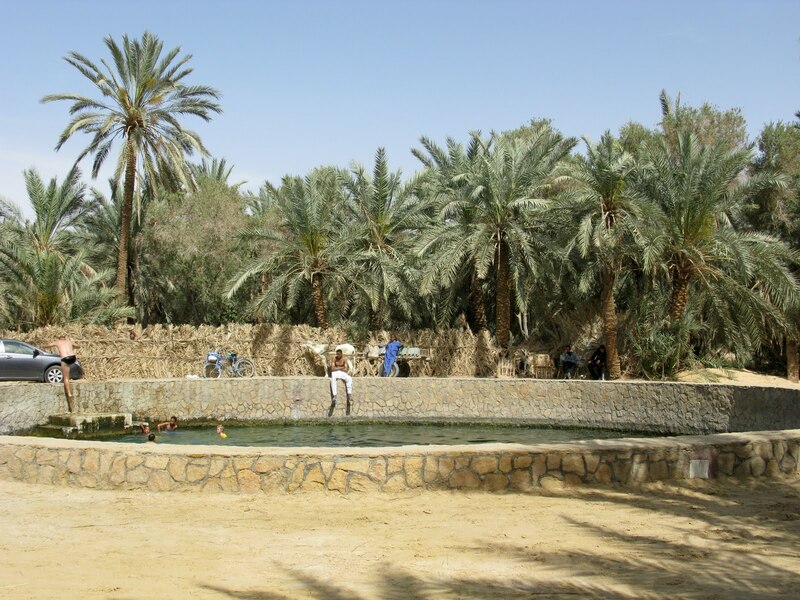 The people of this oasis are closer to the Berber tribes of Libya and they all wear the white djeballa and the houndstooth checked keffiyes which you don’t really see elsewhere. 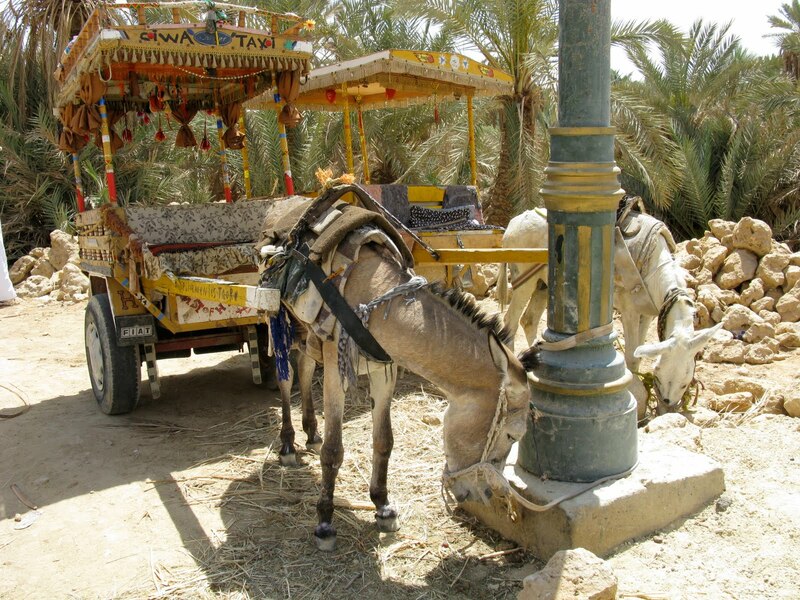 Donkey carts are the preferred modes of transport and even constitute the Siwa Taxi service, all festooned and decorated. In the evening we hired bicycles from the market, wonderfully rickety, but serviceable and rode out along a little track into the lake to Fatnas Island, which became a palm-fringed peninsula located on the edge of a saltwater lake. The lake is akin to the Dead Sea. We could actually float sitting up in the water, sipping a beer and watching the sunset and the moon brighten simultaneously across this vaste expanse of water in the middle of the desert. It was surreal, the most amazing experience. There was a fresh water tank to dive into once you got out of the oasis to wash off the encrusted salt – all crystallized on your body. Then we cycled back to the market in the bright moonlight. Our hotel is the Siwa Garden resort with truly lovely gardens surrounding a fresh mineral spring swimming pool. The architecture is the same mud huts that I mentioned earlier and it is a beautiful spot, very well run. On the drive back to Cairo, a stop at Alexandria is well worth it, the new library is remarkable and may well go down in history as a worthy descendant of it’s famous predecessor. I went to Egypt to do something quite different and came away totally enchanted with what I did do. 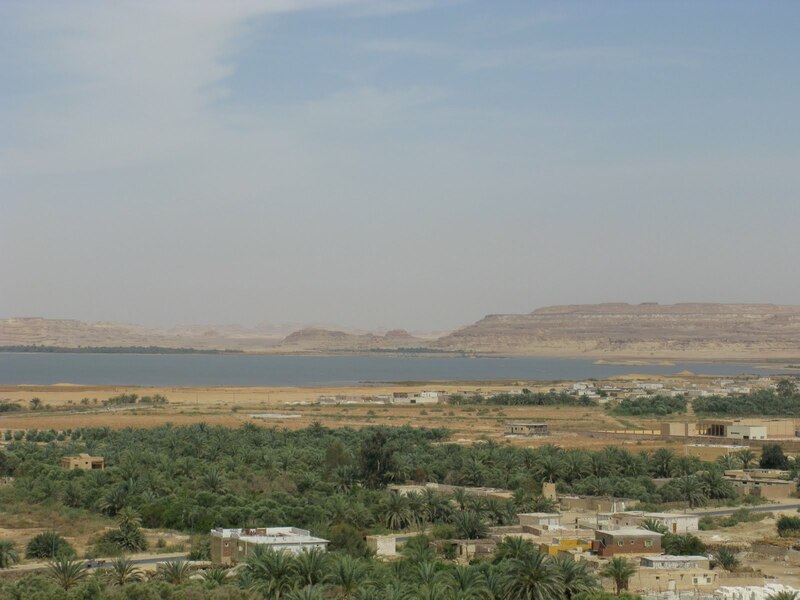 The Nile and all the regular Egyptian destinations will happen some day, out of the way Siwa was like a gift that fell into my lap. A little place of wonder far out in the nowhere land of sand. Isolated in it’s remote fastness of trans Himalayan mountains, the Spiti valley is a forgotten wonderland of cold mountain desert. Sheer cliffs weathered by wind and erosion into the most fantastic pinnacles and battlements, abut on the silvery snake of the Spiti river which meanders in the upper reaches across a wide valley and constricts to a torrent lower down. Amazingly preserved Buddhist monastries are precariously perched on pillars of rock and sand, or nestled into sheer cliffs. They have been completely untouched by the outside world till just a few years ago and still preserve some of the oldest artifacts and forms of Buddhism. Amongst all this vastness of space and mud mountains suddenly the mind is bewitched with an oasis of green around a tiny village. The people, not being used to outsiders are rather shy, but warmly hospitable. They live an incredibly harsh life. They have one growing season and that crop of ‘Satu’, peas, potatoes has to last them the whole year. The mainstay of their lives are the yaks – these multipurpose animals are the beasts of burden, transport, meat supply, milk providers and their skins are used for clothing and blankets. They are extremely ornery animals and riding them is an adventure all it’s own. For one, sitting astride a yak is a little like doing a gymnastic split. They don’t take kindly to manouvering either, their minds are quite firm on what direction they will take and you just ride along willy nilly hanging on for dear life. The first time I visited Spiti, we trekked across the Pin – Parvati pass from the Kullu valley. I do not suggest that this is the best way to get there, however it is the grandest of all treks and descending into the Pin valley is an experience, awesomely sublime! *The year was 1991 and the end of June when my intrepid aunt Prem, her daughter – my cousin Pia and I decided we were going to attempt the Pin-Parvati trek. End June is still rather early for high altitude treks as was brought home to us by the many well wishers in Manali who tried to dissuade us. None of this deterred us, what almost turned us back was the tedium of dealing with the ‘babbudom’ involved in getting permits to go into Spiti. Those days even Indians needed to get a special permit, Spiti forms a part of our border with Tibet/China. We finally got the permits. Also a local guide, who knew how to get to the pass, but not beyond. Gear was sorted, supplies packed and we finally set off. The first leg of the trip is up the Parvati river valley. She is a young, beautiful, powerful river descending through a steep sided, deep valley. The motor road only went a little way up the valley to the little town of Manikaran. The track left the river and wound up through thick oak and rhododendron forest, a long day’s hike brought us to Pulga, the last village in the valley. Those moments after you set up camp, sit with a hot cup of tea and just soak in the amazing vistas are indescribable. The terraced village fields, bursts of fiery red rhodendron flowers amidst the green depth of the forest. Shimmering waterfalls from the melting heights and those soaring mountains all around. I have only ever found one word for it – magic!! The next few days we climbed higher, camping one night in a meadow by a hot spring. Lying in that pool of boiling water, surrounded by the singing of the wind in the cedars and watching the colours of the sunset on the snows and the clouds. This would be my description of ultimate, sublime luxury. There is a definite energy in that valley. Parvati is the Mother Goddess, the daughter of the Himalayas and the source of power. She watched over us. The monsoon was building up and we were worried that it would catch us before we got to the pass and climbed into the rain shadow. But those thunderheads stayed behind us all the way, shadowing the valley behind while we continued in sun shine and fair weather. For myself, I intensely dislike looking down at my feet while water drips off my hat and the vistas are left to one’s imagination. Wet tents and sleeping bags are not to be borne!!! Two uncanny incidents occurred during our walk up to the source of the Parvati, the Mantalai lake. Three days into our trek, we had left all sign of human habitation and were above the tree line. We camped in a meadow that was like a Japanese garden. Artistically placed rocks, stunted juniper bushes and scatterings off buttercups and blue Himalayan poppies. Through it all burbled an enchanting little stream. Into our little camp came a saffron clad ‘pundit’ and his boy ‘chela’. Now for all the sunshine, once the sun went down, the temperatures dropped drastically. We were above 4000 m, there was a wind chill factor. We were huddled in down jackets around our little camp stove. (No wood here to make a fire.) Then in walked these two barely clad people carrying nothing more than a cloth bundle. Obviously we asked them to share our meal. In conversation we learnt that they too were heading to the Mantalai lake. They were traveling from South India to perform a special ceremony at the lake. It was then we discovered that the lake was one of the centres of great Tantric energy . The mysticism of Tantra is so little understood. All that a lay person knows about is the amazing power and obviously, as all power, it may be wielded for both good and the opposite. Most stories recounted are scary, of black magic and sacrifice. Thankfully we never have had the likes of the Inquisition, else more than half our priests would have been burnt at the stake! However, this strange meeting was spooky. The ‘pundit’ looked and spoke like a kind learned man. But uncanny was the response we got when we asked how he was planning to travel the rest of the distance with no food or supplies. So far it was imaginable, there had been villages and people who would have sheltered and fed them. ‘What would you have done tonight if you hadn’t met us?’ we asked. He looked quizzical, ‘But you are here.’ Was all he said. We climbed further up the valley, the river was narrow and a broiling, leaping froth over huge boulders and then the valley opened up into the debris of glacial moraine, rubble, scree, boulders, still interspersed with amazing flowers and little meadows of tough, scrubby grass. The next two days, the priest and his companion appeared every evening when we set camp. We shared our food, they would stay and talk for a while and move away to sleep. About their lack of cover or bedding. He said all senses were controlled by the mind. It was an amazing person that we had the good fortune to encounter, that we were too spooked to actually enter into that experience fully is a pity. We were spooked. As I mentioned, the hearsay about Tantrics is scary. ‘Would we be possessed, sacrificed, turned to stone?’ Actual thoughts. So our conversations with him stayed to surface things. Not even asking what kind of ceremony or prayer he was going to perform at the lake. I don’t think he would have told us, but honestly, we were too scared to venture there. I say ‘said’ because that’s what we realized later. At the time we thought it was a question. It’s true that our guide had never been across the pass, but an old uncle of his had, and with that basic knowledge, our map and compass we were going for it. There is a large boulder in the centre of the river here and a series of smaller ones leading to and from it creating a bridge. So essentially you use the smaller boulders as kind of stepping stones, then do a little bouldering on the mammoth in the middle and hop,skip and jump across to the other side. A little slip would mean being churned into some frothing raging white water. We thought we’d tackle it better in the morning after a rest. It had been a short walking day. We were camped in a pretty little meadow by a Gaddis (shepherds) rock shelter. The Gaddis are nomadic herdsmen that bring their flocks up to these pastures in the summer. It was early for them yet, but their shelter did just that, sheltered us from the incessant wind that blows in these areas from mid day to dusk. While we were setting up camp, we heard a hail and saw a man in homespun shepherd clothes come bounding down the hill behind us. Rather surprising. There were no flocks and he seemed alone. Also he was a very large man, unusual for the area. Well he came leaping down the hillside and there was this tall, red bearded, white man, incongruous in the pajamas and woolen coat of a shepherd. I can’t even begin to tell you how astounding this was. We just gawped. So, in that lone spot we were becoming a crowd. Luckily he carried his own food. Our rations were certainly being stretched and we still had at least another ten days of hard travel before we possibly hit a replenishment point. John was funny and strange. Seems he’d been traveling in the mountains for some years. He came from America every summer and wandered the Himalayas. What he did back home we never quite found out. But here he was, a big American in ‘Gaddi’ garb, red beard and ponytail, pyjamas, homespun wool coat and well worn mountain boots. Shy, very proper manners, had barely ever spoken with an Indian woman because he believed it was taboo. Well, in the remote places he’d been wandering he was half way right. Certainly not taboo, but definitely not done, even had the opportunity arisen. We are a hospitable people, and within that concept of hospitality it is polite to enquire after a person, their family, what they do. It is not just rude curiosity, it is to welcome and absorb. Unlike the Pundit, John was a curiosity we definitely needed to question. So where, what, how, why, does this man fall off a mountain in the middle of no where, searching for us? He heard about us at the permit office in Kullu where he’d been trying to get a permit for Spiti. Hadn’t got it, but thought he could accompany us to the pass at least. Well that explained trying to catch up with us. Nobody would attempt that pass alone. He just seemed to be the ultimate explorer. Travelled only in the mountains, kept a badly lettered journal. Ok, so this seemed to be self discovery and knowledge, just for himself. Bit of an anomaly that you could get them elsewhere in the world. However, here was our guide, or at least his map gave us a chance to find the right route across. We had been quite willing to follow the compass and a general direction. It would have got us down the other side willy nilly, whether into Spiti, the district of Kinnaur or back on this side into the next valley was any body’s guess. The Pin Parvati is a cross roads pass, currently heavily snowed under, chances of our distinguishing land marks were rather slim. So, that all seeing pundit already knew this? We had courage enough to ask if John was whom he had meant when he said our other guide. The distance from Pandu Pul to the Mantalai lake is a days hard walking. No regular path or trail, it’s just a lot of boulder hopping finding the easiest route over the glacial moraine. Hard on the legs and blistering to the feet, so when we found a tiny meadow beside a mammoth rock about mid afternoon, we decided not to beat any records and give ourselves another day to get there. There was a large cave under the monolithic rock. Obviously used as a shepherd shelter. It provided a much needed break from the ever present keening wind. The river was broken into silver ribbons spread across the morraine, the high peaks of the range were up ahead glittering white. The pundit had gone on so we didn’t have his company. It was a lazy sun baking afternoon sheltered behind the ‘cave rock’. We had rather necessary, freezing water, baths. Chalked out the route on that wonderful map. Re distributed the weight in our packs and generally got geared for what was going to be rather a challenge. Our attempt to cross the Great Himalayan Range over the 5320 m high Pin Parvati Pass. Unlike other passes in this range of mountains, which are traditional shepherd routes, the Pin Parvati is not used by shepherds. The meadows around the lake are as far as they bring their flocks. This pass was discovered or rather first documented by Sir Louis Dane in 1884 as a possible entry from the Kullu to Spiti valleys. However it has never been a regular route for any travellers. Offering neither an easy approach or a quick crossing. One of the reasons for the Spiti valley having remained so isolated and untouched has been it’s inaccessibility. Ringed by high mountains to the north, east and west, the passes that do allow access are all over 5000 mt. 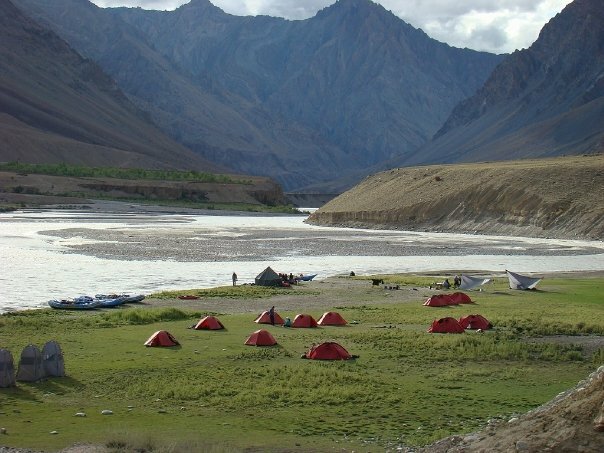 To the south where the Spiti river flows and joins the Sutlej is the stupendous, perpendicular walled Sutlej Gorge. We got to the lake in a hop skip and jump the next morning. It lies like a little jewel in the hollow of towering mountains. The priest was already at prayer on a little peninsula of land that pushed into the lake. We kept the width of the lake between us and set camp on the near side, to not disturb as much as to get as far away as possible from any effects. The snows had only cleared off little patches of spongy, damp meadow immediately around the lake. That small patch of water in the midst of the mountains turned every colour of the rainbow and then some more through the day. From a mirror reflecting an upside down world in the morning through, aqua, turqoise, teal and emerald into blushing pink, lilac, mauve, indigo blending into ash and sparkling silver in the moonlight. It is not easy to describe that place or the sensations it evoked. There was a timelessness, a hush, a serenity. A sense of eternity, immensity and evanescence, all encompassed in the one. The expanse of the soul and the mote that is you. The great mountains, draped white in the hollows, with jagged pinnacles piercing a blinding blue sky. The stillness of the pundit in his saffron robes across the smooth calm waters of the lake. The burble of the tiny stream leading out of the lake, the incongruity of this trickle of water turning into the gushing, springing river we had followed up. The trill of a lark and the call of the lammergeier as it wheeled lazily in that expanse. Just thinking of it carries me away, I just hope I’ve managed to get it across even half way. We scouted out our direction for the start of the climb but stayed at the lake that night. Prayed for a clear cold night so we’d have a firm walking surface the next morning.